A few weeks ago, I was finally able to see Mad Max: Fury Road, the most recent installment of George Miller’s long-running dystopian movie franchise. I went in with significantly higher expectations than I would normally have for a Mad Max movie, but even with that, I was not disappointed. Miller managed to take the distinctive post-apocalyptic aesthetic which he largely shaped through his earlier movies, and managed to tell a very different kind of story, while still embracing the absurdity and excess that made his earlier movies into cult classics. I’ve also been immersed in another post-apocalyptic setting for the last few weeks – the world of Nintendo’s new multiplayer shooter, Splatoon. For anyone who knows me, this should be no surprise, as games about squid people living in post-apocalyptic ruins are kind of my thing. Of course, this is not necessarily how the game’s setting appears when you first pick it up. The brightly colored city of Inkopolis hardly seems different than other Nintendo settings like Dream Land or the Mushroom Kingdom. Like Planet of the Apes, Splatoon employs the familiar trope of the “Future as Past,” where a primitive social structure is ironically juxtaposed with the post-apocalyptic setting of the story, the latter generally being withheld from the audience1. In this case, however, the future is not modeled after stone age nomads or feudal estates, but a hyper-consumeristic 21st century metropolis. Specifically, the city of Inkopolis is a caricature of modern Tokyo, complete with its own versions of Tokyo Tower and Shibuya Crossing. Although some areas like Bluefin Depot offer glimpses of a flooded world where towering cities creep to the edge of the remaining dry land, the world of Splatoon seems remarkably bright and happy, especially when compared to the wastelands of Mad Max. If, however, we look at Splatoon in the broader context of Japanese disaster movies, this stylistic dissonance makes much more sense. In Western media, the city itself is often viewed as an object of suspicion. In films from Fritz Lang’s Metropolis to Terry Gilliam’s Brazil, the city is portrayed as an impersonal dehumanizing force. The ubiquitous visual imagery of the bombed-out city in Western post-apocalyptic cinema can be seen as the deserved fate for these symbols of civilization’s hubris. In Japanese film, however, this is not the case. As Donald Richie argues, the primacy of one’s home city or furusato in Japanese culture meant that the city itself never became demonized because it was never given the same cultural importance as it was in the West. As such, it is not the cities that must atone for the sins of civilization, but the people. Tokyo’s frequent destruction in movies like Godzilla, then, is more a matter of convenience. The city is not the target of the attack, but merely the best location for disposing of large numbers of people2. Though academic circles warn of rising sea levels, the policy makers pay them no heed. At this rate, human civilization may be lost beneath the tide. Will even this furry fellow [a cat] be consumed by the raging ocean? Thus, where Miller’s wasteland shows a future with humanity devoid of cities, Splatoon’s Inkopolis imagines cities without humanity. There are, however, other ways in which Splatoon much more closely resembles Western post-apocalypse stories like Mad Max. The theme of resource scarcity forcing survivors into conflict runs throughout both worlds. 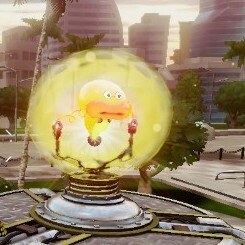 In Splatoon, the coin of the realm is not gasoline, but bioelectric energy in the form of Zapfish – electric catfish that have evolved or been bred to generate enough energy to power the vast Inkling cities. The single-player storyline begins as the Octarians, who were banished from the “civilized” surface world, steal a number of Zapfish from Inkopolis, including the Great Zapfish that powers Inkopolis Tower. The player then takes on the role of the unlikely hero in retrieving the Zapfish from the Octarian’s network of subterranean domes. 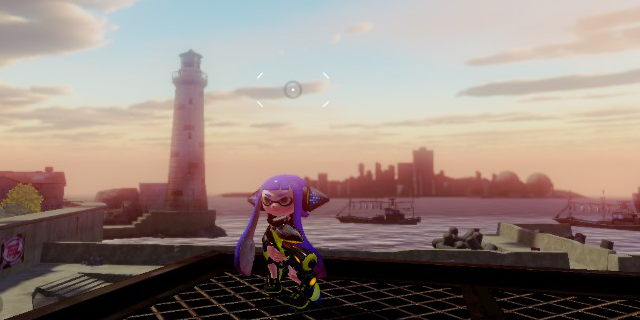 As the player explores the Octarian domes, she will encounter much more familiar post-apocalyptic scenery. Unlike the Inkling cities, which are modern and vibrant, the Octarian domes appear to be filled with and partially constructed from the ruins of human civilization. Floating bridges, dolosse, Ferris wheels, and carousel animals float about, presumably as a result of the anti-gravity technology the Octarians use in their flying saucers. Though in many ways more technologically advanced than the dominant Inkling civilization, the Octarians are a society in decline. The infrastructure of their domes is aging and crumbling and their society is plagued by energy shortages. The Octarians themselves also fit well into established literary and filmic tropes, filling the role of the mysterious and dangerous underground villains, like the mutants in Beneath the Planet of the Apes or the Morlocks from H. G. Welles The Time Machine. 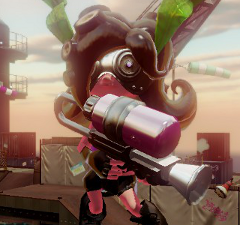 The Octarians’ most deadly soldiers, the Octolings, are perhaps the closest to Miller’s Mad Max aesthetic, donning goggles and armor made of black leather and shiny chrome. Like Mad Max: Fury Road, Splatoon is interesting not just in the way that it exemplifies existing post-apocalyptic tropes, but in how it plays with and often subverts many of these tropes. As Mick Broderick points out, post-apocalyptic tales often have a strong conservative theme running through their core. They articulate a desire for nuclear Armageddon to annihilate the post-modern burdens of civilization, forcing us to return to a nostalgically yearned-for agrarian life. The “good” people in such settings are those who rebuild society through a return to conservative regimes of patriarchy, monogamy, and often racial and cultural homogeneity. They are shown in sharp contrast to “bad” people, those who nihilistically consume or destroy what little remains of the old world1. By subverting these dichotomies, Miller creates a very different kind of villain in the character of Immortan Joe. Unlike the Humungous of The Road Warrior, Joe and his War Boys aren’t simply wandering marauders, destorying with no thought of the future. They pump water and grow crops and engage in commerce. Immortan Joe’s villainy isn’t in wanton destruction, but in the use of wealth and violence to enforce social inequality. Splatoon, unlike many other Nintendo franchises, also resists clear dichotomies between good and evil. Although the Inklings are the protagonists of the game, their culture relishes the kind of excess normally reserved for villains. They are described as creatures that live for nothing but “battle and fashion,” with their culture revolving around what is essentially ritualized gladiatorial combat. Rather than extolling the moral aspect of returning to a simpler life, Splatoon revels in the frenetic excess of Inkling culture. 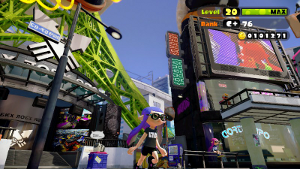 Inkopolis is not an agrarian millennial utopia, but a pluralistic cosmopolitan hub. It’s a different vision of the apocalypse than we normally see, and one that I hope Nintendo continues to take in new and interesting directions. There are certainly other similarities between the worlds of Splatoon and Mad Max that I could bring up. Both feature guns made out of re-purposed gasoline pumps. Both feature the protagonist battling a warrior-musician in a crazy helmet, riding atop his own personal mobile speaker system. Perhaps most importantly, both are amazing, genre-defying works that are difficult to do justice to in a single blog post, so I encourage you to go check them out for yourself. 1. Mick Broderick. Surviving Armageddon: Beyond the Imagination of Disaster. 2. Donald Richie. Attitudes Toward Tokyo on Film.